Quick, what is a champion? Do you know? How do you become one? Can anyone reach the status of champion? I believe so. Anyone who is passionate about something, anything, and loves what they’re doing, has the potential to do extraordinary things. Whether it’s sports, business, teaching or whatever, anyone can strive to become a champion. Name three people you admire as champions. What are the five characteristics that make them a champion? What is your definition of a champion? The answers can be inspiring and everyone has a good time with this mental exercise. Answer these same questions for yourself and see how your responses compare to those from a recent session with my students. The kids’ top five choices for champions they admire were: “my brother”, “Mia Hamm”, “Pete Sampras”, “my tennis teacher”, and still making the list is “Michael Jordan”. The adults leaned more toward family members, but also included “God” and “Oprah” in their responses. The characteristics of a champion received a wide variety of responses, but they didn’t vary all that much between the children and the adults. “Practice”, “determination”, “always do their best” and “hard work” from the kids are the same as the adult answers of “good work ethic”, “strong desire to win” and “never gives up”. These questions fire up the thinking process and help us understand what makes a champion. As PTR tennis professionals, our students look to us, not only to show them how to hit a tennis ball, but also for guidance, motivation, and inspiration. When we finish a class, our students should feel as though they can do anything. Here are some tips that will undoubtedly lead your students in the direction to become champions. Everybody has the potential to be a champion. We can accomplish anything we want with our lives. No matter who you are, where you come from, or where life finds you this minute, you can succeed. Yesterday is history. Start focusing on the future. It doesn’t matter if you are rich or poor, deaf or blind, disabled or able bodied, you can do anything. All it takes is a dream. If you want to do something great with your life, then do not be afraid to dream. Do not be afraid to achieve when everybody else sees it as impossible. Do not be afraid to dream when things never seem to go your way. Just Dream It! It’s doubtful that the person who invented the space shuttle just went to the junk yard and started building a space ship. First he had to imagine what he wanted to do before he could make it a reality. Let your imagination take you places you have always wanted to go. Visualize what you really want to be doing. What is your dream? Visualize yourself achieving this dream step by step. Champions are passionate about doing what they do. They love what they are doing. Don’t be afraid or concerned with what others may think. Visualize your dream. Dreams do come true. Here is a list of 10 daily action tips. Keep them posted where you can read them each day. Make a copy of this list and share it with your class. Remember this famous quote: “If it is going to be, then it is up to me”. Dreams don’t just come true. You can’t sit around wishing and hoping and praying for your dreams to come true. You’ve got to get up off your duff and take action. You’ve got to go for it. Go for your dreams! Make it happen! Having a dream creates hope, gives us the energy and the drive to accomplish great things. If you are uncertain where your talents and abilities lie, then go out and find them. Everyone of us has the potential for greatness within ourselves. It is up to you to use that potential to the fullest. Getting started by taking action is tough for anyone to do. If you can dream it, you can do it. Take action! Don’t just sit around waiting for the right time. Today is the right time. Get going by setting goals, taking a class, or facing your fears. “Even the longest journey begins with a single step.” You must take that first step. Sometimes, I feel as though my hearing loss is a blessing in disguise. When people start talking negatively, I can adjust the volume switch on my hearing aid so that I don’t have to listen to it. I am very careful what I listen to each day, preferring to keep my mental food positive. The more people say negative words, such as “bad” or “can’t”, the more they will come to believe it. When I hear my students complain, I remind them to replace those negative words with positive ones. 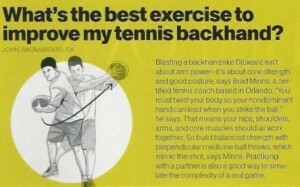 Change “my backhand is terrible” with “I love my backhand”. Substitute “my serve is really bad” with “my serves are getting better”. Another great way to improve your attitude is to read motivational books and books about people who have done extraordinary things with their lives. Turn off the television, get outside and walk in the park. Fill your mind with a dose of positive fuel every day. Discipline yourself to stay away from movies that are full of garbage. Being positive is a choice. Choose wisely. Abraham Lincoln said, “The best thing about the future is that it comes one day at a time.” Learn to be patient and take each day as it comes. Make sure that you do your absolute best each day. Somewhere along the road to achievement, we all experience our share of failures. As champions, we know that failure is never final. Babies are the world’s most natural champions. When a baby is learning to walk, it will stand up only to very quickly fall down. Have you ever seen a baby stay down for very long? Heck no! That baby gets right back up and tries again … and so should you. Way to go, Baby! In 1985, I found myself behind 5-0 in the third, in the best of five, during the World Games for the Deaf in Los Angeles. At first, all of my supporters were cheering, but after three and a half hours and my dismal showing, they headed for the exits. They quit believing in me. But, as a champion, I didn’t stop believing in myself. Before long, I found myself winning the third set tie-breaker, then the fourth set and then the fifth to claim the championship. 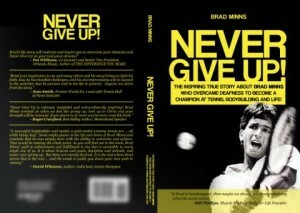 That game taught me a great lesson, not only in tennis, but in life. No matter how far down you may find yourself, you must never give up! The choice is your. Are you ready to live each day like a champion? Get started today by following the 10 daily action tips. Pass the tips on to others. Start learning what your students’ dreams are on and off the court. Encourage them in any way you can to go for it! We are the Champions!